While being employed at a factory can be a well-paying job, it is not easy work and can be dangerous. Workers can suffer debilitating injuries or die. It can make a devastating situation even worse to discover that an employer is a non-subscriber employer who has opted out of workers’ compensation benefits when an employee needs to file a claim for benefits. However, these workers have options for compensation under Texas’ non-subscriber employer law. How Do Employees in Factories Suffer Injuries? Heavy machinery. Factory workers use heavy, dangerous machines. When they are not trained in how to safely use them and the machines are not well-maintained, workers can become injured. In addition, workers can suffer amputations and crushing injuries if caught between heavy machinery and other objects. Forklift machines. Forklifts require specialized training to operate, and incidents leading to injuries are common. A few of the ways workers are injured include the driver being ejected, the forklift tipping over, and the operator hitting nearby co-workers. Heavy objects. Factory workers must lift heavy objects, often repetitively, and can suffer overexertion injuries to their arms, shoulders, neck, and back. Slips, trips, and falls. There are many dangers of a slipping, tripping, or falling in a factory. Food and drink spills, parts, debris, and spills of liquids and dry goods used in production can cause an unsuspecting worker to hurt himself in a fall. Industrial illnesses. Factory workers are exposed to toxic substances, like chemicals, fumes, asbestos, and dust, which can cause life-threatening occupational illnesses, sometimes decades after the exposure. Workers can suffer respiratory illnesses, cancer, asbestos-related diseases, deafness, and other disorders from exposure to hazardous substances. Fires and explosions. A fire or explosion at a factory can be catastrophic if it causes the igniting of some of the flammable substances used and stored at the plant. Workers can suffer serious burns and permanent disfigurement—if they survive. Transportation. Workers can be injured in a vehicle crash when trucks and other vehicles are moving around the loading docks and other areas of the plant either as another motorist or a pedestrian. 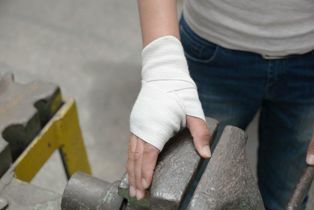 If you were injured while at your factory job and work for a non-subscriber employer, the Hart Law Firm is here to help you assert your rights to compensation from your employer. Please feel free to contact us online or call us directly at 817.380.4888 to schedule a free consultation today. We help injured victims throughout Texas including Arlington, North Richland, Grapevine, Bedford, Hurst, Euless, Irving and all points in between.